Combine carcass with water and chicken bouillon and bring to a boil. Reduce heat and simmer for three hours. Remove bones and add meat to broth. Add all remaining ingredients except tortellini and simmer until vegetables are tender. Remove bay leaves. Add the tortellini and cook for 15 minutes. 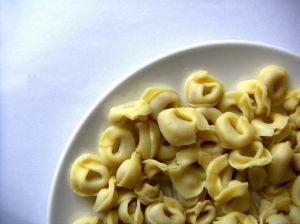 If freezing the soup, add tortellini when serving. This recipe makes eight quarts.